Transitions, in life and on the calendar, fascinate me. (Not a new interest: As evidence, I give you this post, and the series of recipes that followed, from spring 2012.) Now, for instance, the leaves are changing colors, but it’s still warm; you can’t yet put away the shorts and sandals. You’re ready for pumpkins but, at the same time, hanging on for dear life to the last of the tomatoes, eating as many mayo-and-tomato toasts as humanly possible. Wasn’t it yesterday that we were eagerly anticipating the warmth and delights and vacations of summer? And who decided on just four seasons, anyway? I see a good many more than that. But sometimes, it’s weightier than this. You might still love the thing you’re in—or maybe you don’t, or maybe you never did—but it doesn’t fit the way it used to. The season is ending; change hovers on the horizon. At times, I’m sad to see the previous season go. Other times, I can’t wait for the next one. More often, it’s something in between. It can be hard to celebrate the transition, to cheer for the in-between times, to savor the moment that comes just before the next big thing, before getting over there, wherever that might be. But we are so often in these spaces. It’s exercise worth practicing. This dish is one of very few things I know that revel in the transition, and I tell people about it all the time, so it’s high time I share it here. It’s on rotation every year in this Oakland apartment, something to look forward to as summer winds down and autumn creeps in. The recipe is the very first in Ottolenghi’s Jerusalem, and I think it’s often missed in the flipping of pages, which is truly a shame. There are figs, soft and sweet like summertime. There are sweet potatoes, autumn’s earthy, sturdy contribution. (Already, you know we’re going somewhere good!) They’re pulled together with creamy goat cheese, sticky balsamic and spicy chile. The combination is unexpected but delicious and satisfying, an ideal celebration of this strange, wondrous in-between moment. I burned the sweet potatoes a tiny bit this time around, but they tasted just fine, and the moody look seems appropriate. More than that, though, there’s no time to waste! The window on figs is about to close, at least out here in California, so there isn’t a moment to lose. Serve this with a baguette or a hearty grain salad to make it an easy meal. This is a delightful, unexpectedly delicious combination. Even if it sounds strange to you, I urge you to give it a try! The cheese is optional but really rounds the dish out, so I encourage it. If you’re averse to heat, you can use just half of the chile or leave it out entirely. I’ve also tossed in a pinch of red pepper flakes instead when I found myself without a fresh pepper. A purchased balsamic reduction would make for a helpful shortcut. Finally, I’ll just note that this sweet potato roasting method is pretty genius. Don’t flip the wedges while baking (though perhaps turn the pan around once if your oven heats unevenly) and await the fantastic result of burnished-on-the-outside, soft-on-the-inside potatoes. While I’d say that the ones in the photo above were slightly overbaked, definitely don’t be afraid of a few black spots. Halve the sweet potatoes lengthwise, then cut each piece lengthwise into 3 long wedges, to yield 6 pieces for each potato. (If your sweet potatoes are significantly larger or smaller than noted above, you may want to slice them in a few more or less pieces than this.) Toss with 3 tablespoons of the olive oil, the salt, and some black pepper. Spread the wedges out, skin side down, on a baking sheet. Bake for about 25 minutes, until the potatoes are soft and dark brown in color. Remove from the oven and allow to cool. Arrange the sweet potatoes on a large platter. Heat the remaining oil in a medium pan over medium heat. Add the green onions and chile. Fry for 4 to 5 minutes, stirring often, until the green onions are soft. Spoon the oil, onions and chile over the sweet potatoes. 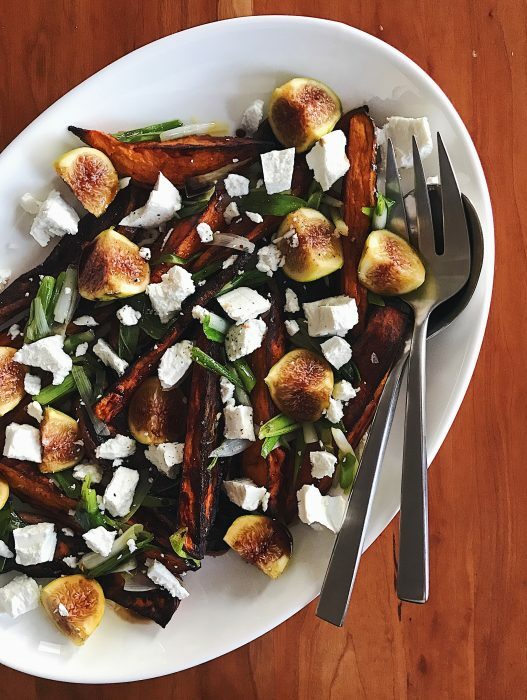 Place the figs among the wedges, then drizzle over the balsamic reduction. Crumble the cheese in large pieces and dot them on top. I think this sounds like a wonderful combo. Your words are always so gentle and true, don’t know how to better describe them. I like these kinds of posts from you. You’re so observant and eloquent.